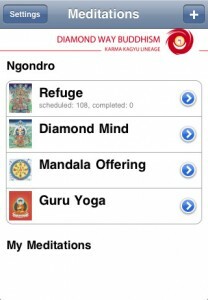 Following the popularity of the DiamondMala, The “MediTracker” for iPhone has now been launched! MediTracker helps you keep track of progress of your practices. It comes with predefined preliminary practices group (can be switched off in settings). 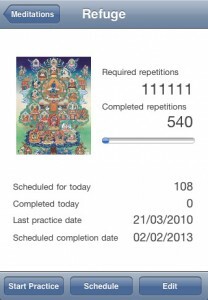 You can create your own practices and create practice schedule based on date you aim to compete practice or number of daily repetitions. It also contains a session timer – simply set timer to required length and you’ll be notified when that time has passed. 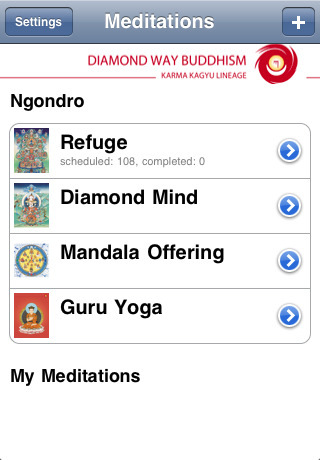 You can be notified by sound or vibration. Each session data (time, repetitions) is stored in database. Click here to download it for your iPod. All profits go towards the Europe Center project. This entry was posted on Friday, July 2nd, 2010 at 10:08 am and is filed under Diamond Way Buddhism. You can follow any responses to this entry through the RSS 2.0 feed. You can leave a response, or trackback from your own site.